Cute rice dish idea for Bento box or Parties! I found canned Hamanako Broiled Eels at a supermarket and it also tasted great! You can maybe get it online since it has a long expiry date! FYI: Umaki is broiled eel wrapped in Japanese rolled omelette (called Tamagoyaki, Dashimakitamago, or Atsuyakitamago). Egg is juicy and eel makes it very tasty. It tastes great even when it is cold. 2. Mix eggs and Yamaki Kappo Shiro Dashi very well. 3. Heat cooking oil in a Tamagoyaki Nabe (rectangular omelette pan), pour a thin layer of egg mixture in the pan and spread over the surface. Cook until half done, place a strip of eel, roll up the egg, and move it to one end. Pour in another thin layer of egg mixture and let it flow under the rolled egg also. Cook until half done and again roll up the egg. Repeat this until half the mixture is gone. 4. Wrap the rolled egg while warm in plastic wrap to even out the shape. Allow it to cool. 5. Cut the egg diagonally and join the cut sides reversely to make a heart shape. Wrap the egg with 1/2 Nori sheet, then wrap in plastic wrap and wait until the Nori gets soft. *it is to define the outline of the heart-shape. 6. Place cooked Japanese rice in a bowl. Add Sushi vinegar while the rice is hot and slice through rice using a rice paddle to separate the grains. Spread the Sushi rice on another 1/2 Nori sheet using your finger tips, little bit moistened with water. 7. 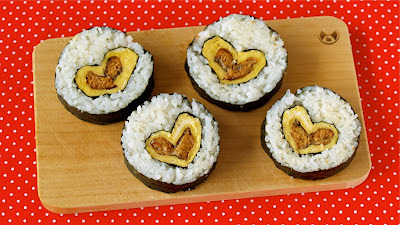 Place an extra Sushi rice for the “v” shape indentation of the heart shape. 8. Place the egg then start rolling. 9. With a moistened knife (bread knife cuts well) cut the roll into 4 pieces (re-wet as needed. don't push but pull to cut). Eat with soy sauce if you like. * Ingredients to make Sushi vinegar from scratch.